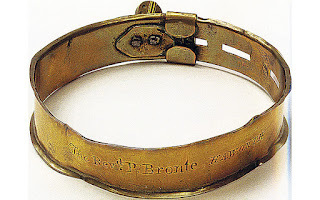 I enjoy very much giving lectures about the Bronte family- I go to different places and meet friendly, interesting people - I have met a relative of Mary Burder, I have spoken with a descendent of the Graham family of Norton Conyers, I have seen the names of four Brontë girls in the log book of Cowan Bridge school and I have been shown precious possessions with a Bronte connection. However to me, perhaps the most important thing is, in the course of my travels, I also learn so much myself. It is always refreshing to talk with people and hear their thoughts on that remarkable family, discover which is their favourite Bronte book and wherever I go, whoever I meet, it is heartening to realise that there is great interest in those who wrote their novels at the Parsonage in Haworth. Last week I was lecturing on Teesside and after one lecture a lady spoke with me and told me she had once, years ago, visited the village of Lothersdale - the village where Charlotte was a governess at Stonegappe House in 1839. She said she had taken tea in the village hall and bought a pamphlet, which she gave me, containing some delicious recipes, the menu of a dinner party held at Stonegappe and little snippets about the village and the house. 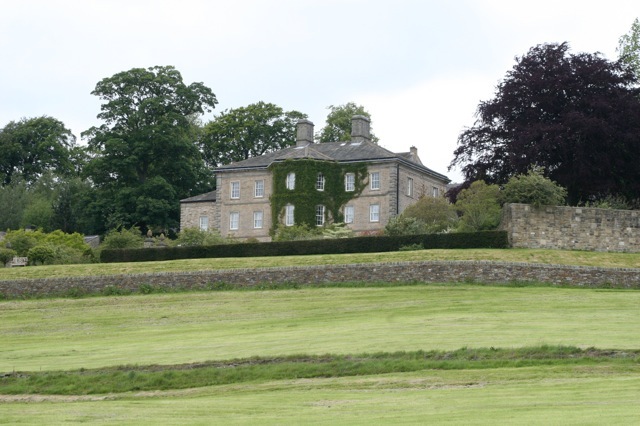 This pamphlet had been compiled by a lady whose parents-in- law had lived there for twenty years but perhaps the most interesting item in it was a short poem, author unknown, written about Charlotte’s experiences in the short time she was at Lothersdale. Don’t tell Mama she’ll be annoyed. And she says that this is not for what she’s employed. Grandpa Sidgwick looked like he would choke. How was I to know the ink would run! Cook came in and spoiled all the fun. I have a feeling disaster is looming. I was told that the James, Henrietta and Thomas were children who lived at the house in the twentieth century and I am sure that they would be not at all like the difficult Sidgwick children Charlotte dealt with in the nineteenth century. Having been fascinated by Lutz's Relics of Death in Victorian Literature and Culture, which is about attitudes to mourning and the habit (still prevalent today in many quarters) of collecting objects intimately associated with a deceased loved one – strands of hair in a locket for example – and having been a little shocked during my last visit to the section on nineteenth century photography in Bradford's National Media Museum, where I found myself studying the faces of dead children in their tiny coffins surrounded by flowers, I was particularly interested in the stance the author would take on the Brontës in this recently published book. I was not disappointed. I was fascinated, not because I am acquainted with many objects associated with the family which are in the Parsonage, the result of many trips there during vacation time, but because of the elaborate connections which Lutz makes. 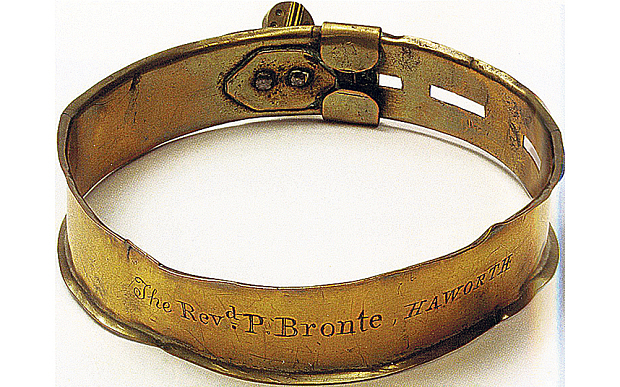 She spins off from the heavy, brass collar which Emily Brontë's (officially her father's) mastiff Keeper wore to give the reader a wealth of information on contemporary attitudes to pets, bringing in references to Emily's poems and Wuthering Heights. What kind of frisson was induced in the author, who adored the huge creature, as she was writing about Heathcliff's hanging of Isabella's dog? Then there is the photograph of a lock of hair which belonged to Maria, the tragic mother of the sisters, who died of cancer before she became grey. Lutz goes into great detail in reminding us of the consequences. According to her, the children “never stopped trying to find in the act of writing a means to overcome death”. She reminds us, too, of Nelly Dean adding Edgar Linton's hair to Heathcliff's in the locket on Cathy's neck. Charlotte's love letters are in the book, of course – how could they not be? We picture very clearly the grim-lipped wife of M.Heger in Brussels as she pulled the torn-up fragments from the wastepaper basket and stitched them back together – perhaps to wave in her husband's face. Lutz's eye for detail is impressive, and her focus on objects is, ultimately, a way of coming back to the poems and novels. This book is one to buy, I believe. A photo of all three sisters? 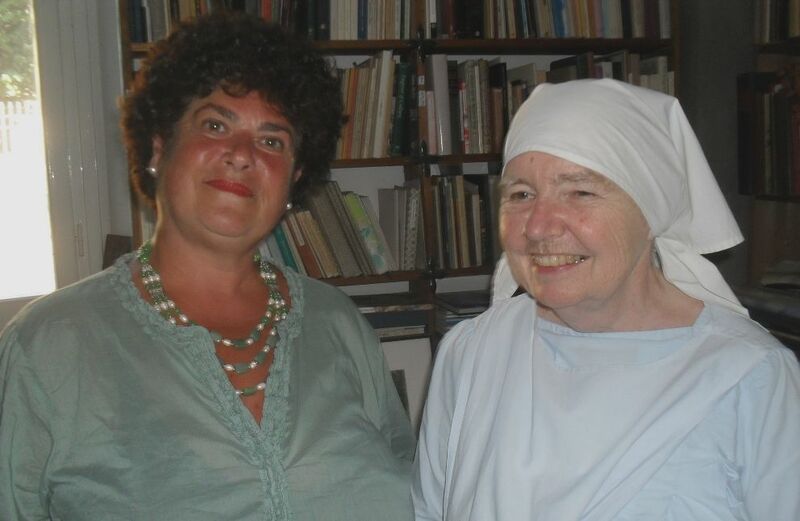 Fourteen years on from a memorable meeting of the Italian Section of the Brontë Society, on 10 July in Florence, I and Professor Elisa Fierro from Lawrence, USA, met up again with Sister Julia Bolton Holloway, a well-known medieval historian and a scholar of the English poet Elizabeth Barrett Browning (http://www.umilta.net/vita.html). 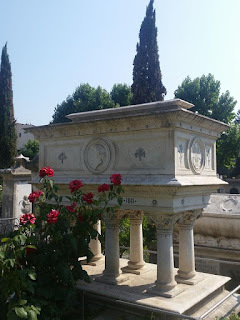 Old Suor Julia is still the custodian of the Protestant cemetery in Piazzale Donatello, Florence, where the imposing tomb-sarcophagus of the famous English poetess is located. She lived and worked for most of her adult life in Casa Guidi and dearly loved Charlotte Brontë’s Jane Eyre. Sister Julia also has a remote ancestral relationship with one of the first students of the Reverend Patrick Brontë and is the author of a fine comparative article concerning the two works Aurora Leigh and Jane Eyre which appeared in BS Transactions 1977. She was very talkative and kind with me, by now the new BS representative of the Italian Section, since she remembered me well despite the lapse of time and also showed with pride all the new books in mediatheca ‘Fioretta Mazzei’, enthusiastically talking of ‘Brontë 200’ preparations. It was really a very interesting new meeting!